I’ve done more edits to my manuscript than I care to admit to anyone but close friends. After looking at it so many times, my eyes have started skimming over parts I thought were fine. The bad news is…they’re not. I needed a way to take a fresh look at this document that I know better than anything else on my computer. I’ve tried changing the font color, the background color, and other assorted tips from writer friends. I fought printing out my MS for a long time. I can read it just fine on my screen, I said. Who needs to waste all that paper, I said. The long and short of it is, I did. Having those same words you’ve looked at (hopefully, and for some of us many more than that) at least a half-dozen times in front of you like a book changes everything. Small words like a and the that you can miss when you are speed-typing, now become evident when that giant stack of pages is sitting on your lap, or desk. I picked up my printing assuming I wouldn’t find much, I was wrong. Here are some things I found, just in the first 12 pages of my MS. Oh, and because I still cringe at using that much paper, I removed all formatting and changed it to single spacing. My 270 page manuscript was shortened to 150 pages. Missing beats where ones were necessary. Missing actions where it was confusing without explanation. You see, I had lost my perspective. I knew the story so well when it was on my screen that the actors in my head were doing everything without my involvement. By printing it out, I changed the way I was looking at it and thus required my mind to become involved, as it was when I was first writing it. 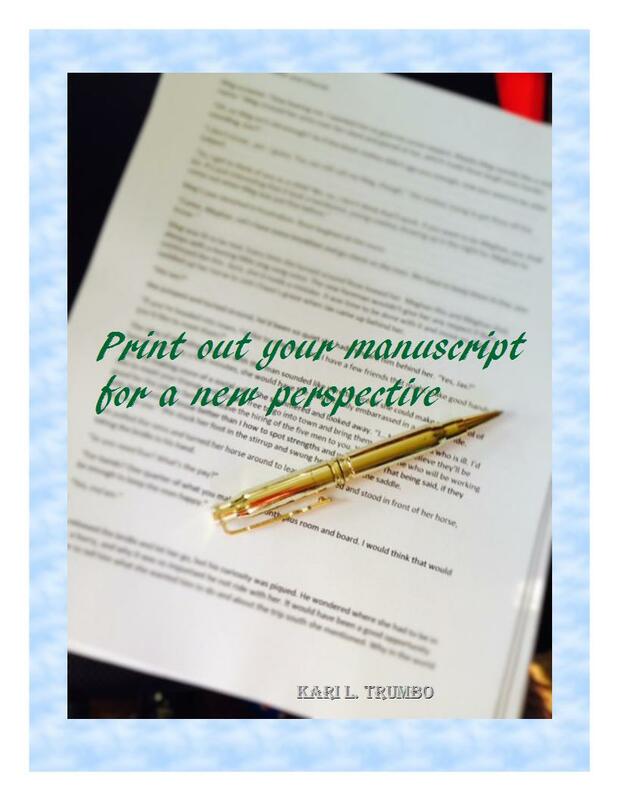 If you aren’t printing your manuscript out yet, give it a try. Please understand though, this should be kept as a last step. You need to go through your manuscript a minimum of six times before anyone else sees it. The great majority of writing is rewriting. If you are consistently paying more money for editing than you think you should be or your editor no longer returns your calls, it might be because the work is more than they feel comfortable charging you for. The more work you do on your own, the less you will pay an editor. So true! Printing it out is invaluable. As you say, best saved until last, or you’ll be going forever. But definitely can’t be skipped. I wish I hadn’t fought it so long. Thank you for stoping by! Great advice, Kari. I always spot more typos when I print it out. And what really bugs me is when I spot an error (if only it was just one) after I press send. I’ve lost track of how many times I’ve gone over my first manuscript.